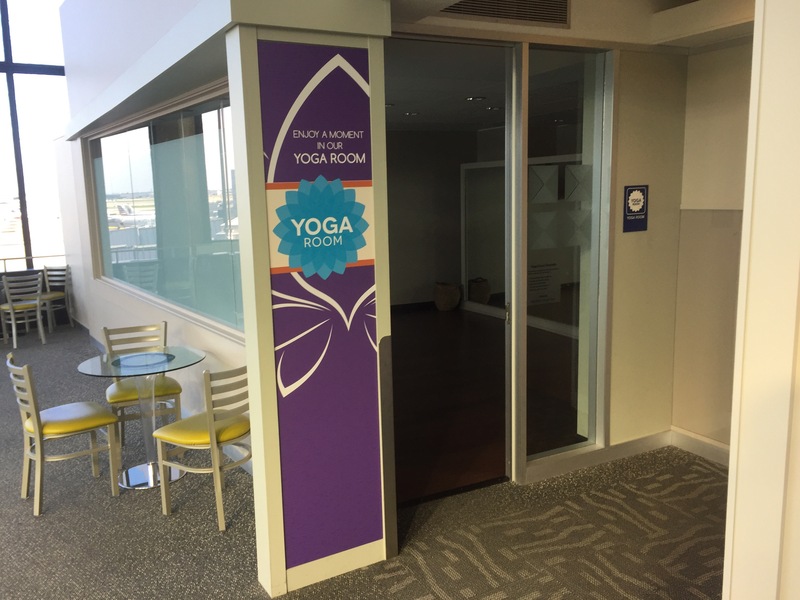 A new trend in air travel is to have a yoga room. I’ve noticed it in a couple of airports, including in San Francisco and Chicago (O’Hare). 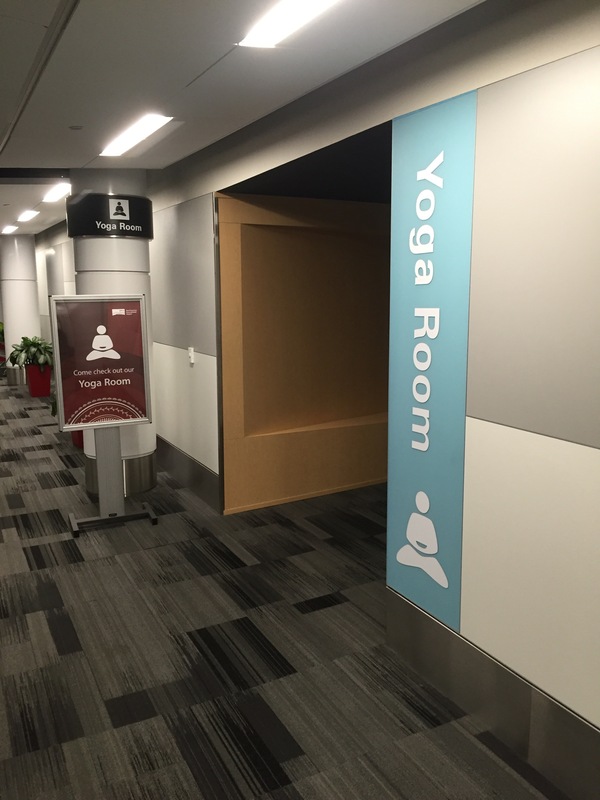 That SFO, the yoga room is in the connector between Terminal 1 and 2, closer to T2. There is plenty of signage so you should be able to find it easily. 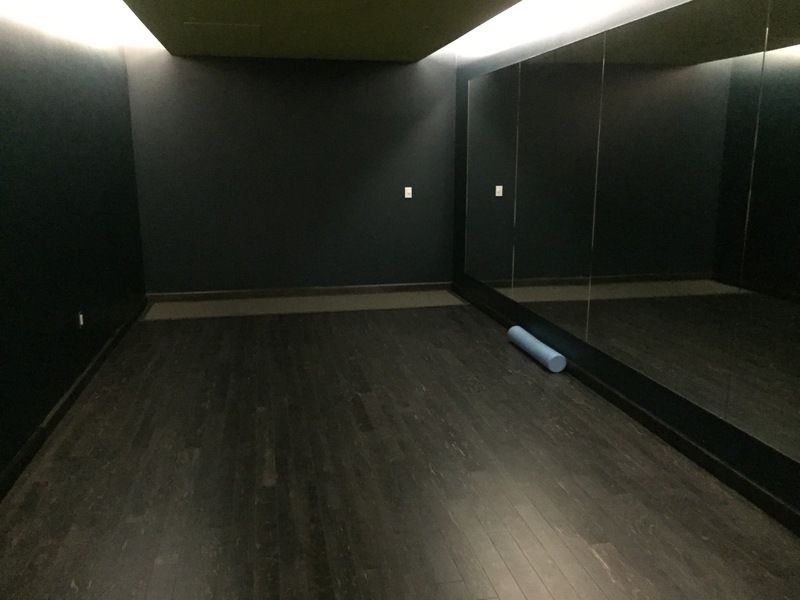 The space has dark hardwood and a mirror covering an entire wall. A sign asks you to take off your shoes as soon as you enter. There’s space for one to sit and leave some luggage. A bin in the corner has foam rollers (!!! ), yoga mats, and some big pillow tubes if you will. There’s a sanitation station as well for you to clean off your mat once you’re done. I spent 45 minutes getting my body loosened and ready to travel. There were quite a few of looky-loos who I just ignored after awhile. Half way through my practice another woman joined me and a third joined just as I was leaving. The lights are dim so it provides an excellent relaxation space. A sign does note that no sleeping is allowed however. 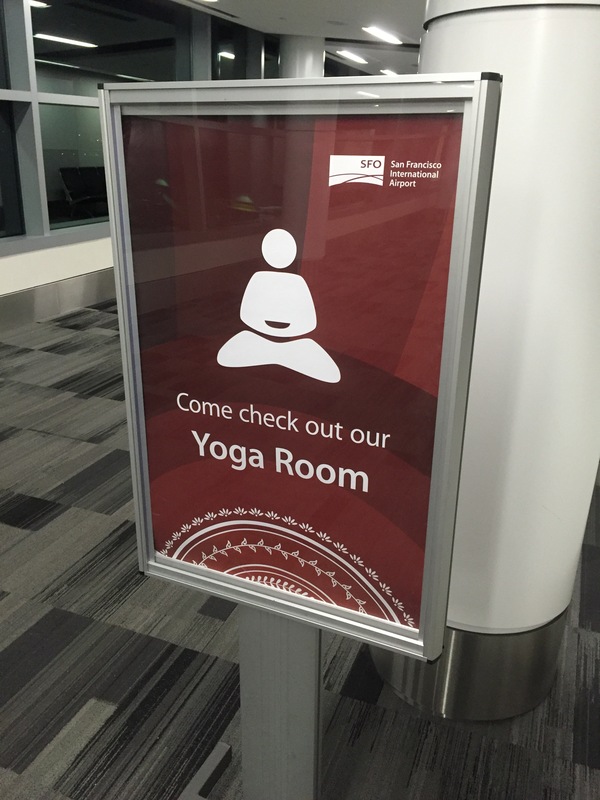 At Chicago O’Hare, the yoga room is on the second floor with the USO and mother’s area. There’s also a cool indoor herb garden. The space has lots of natural light coming through a large frosted window. The door is left open (otherwise it locks shut) but this doesn’t affect the feeling of the room as this area is more or less empty or filled with airport staff trying to find a quiet space away from the hubbub and craziness of the airport. There is a cubby area behind the mirror to store luggage and shoes. 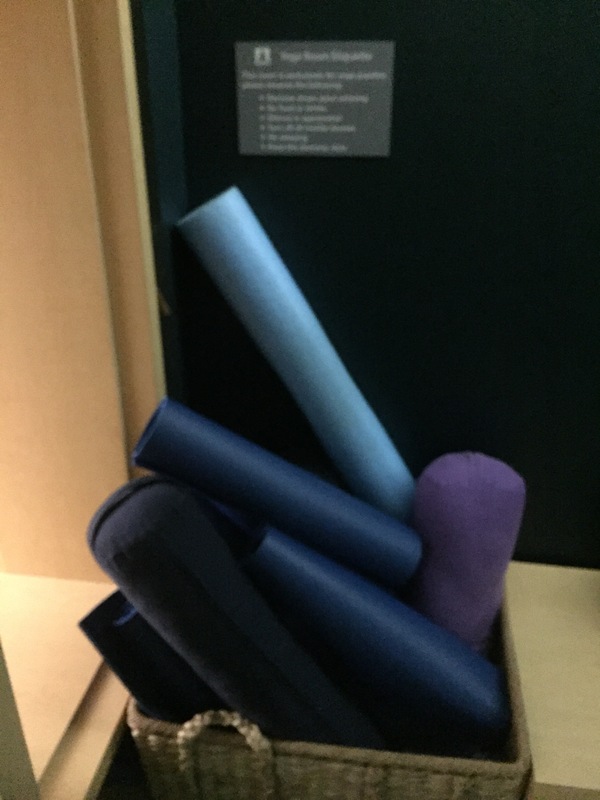 ﻿There are not as many “other items” as there are at SFO but the room comes with a basket of well used mats. Overall both of these places provided an excellent experience and I highly encourage you to take a look next time you see a sign at an airport. 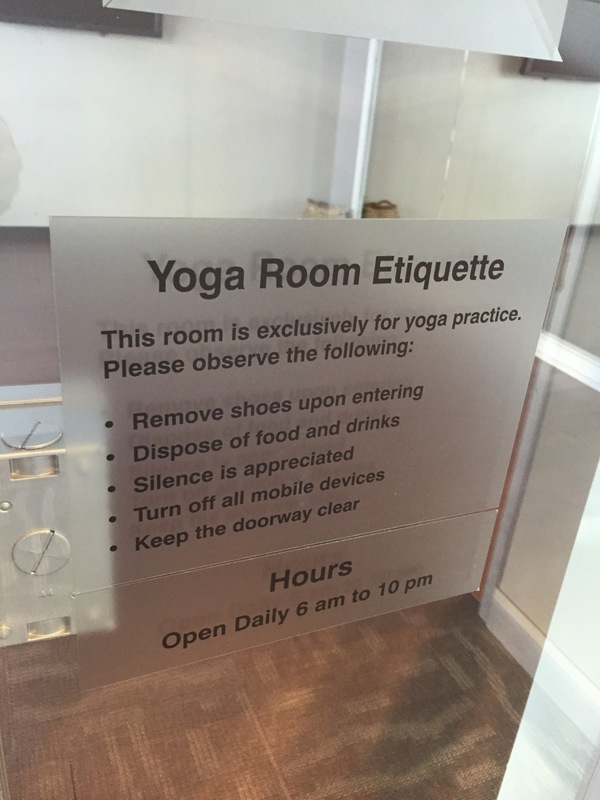 This entry was posted in Uncategorized and tagged Chicago, ORD, San Francisco, SFO, yoga room on June 18, 2016 by kermit206.